Bodysurfing is the art & sport of riding a wave without the assistance of any buoyant device such as a surfboard or bodyboard. Bodysurfers typically equip themselves only with a pair of specialized swimfins that stay on during turbulent conditions & optimize propulsion. Bodyboarding is a surface water sport in which the surfer rides a bodyboard on the crest, face, & curl of a wave which is carrying the surfer towards the shore. Bodyboarding is also referred to as Boogieboarding due to the invention of the “Boogie Board” by Tom Morey. 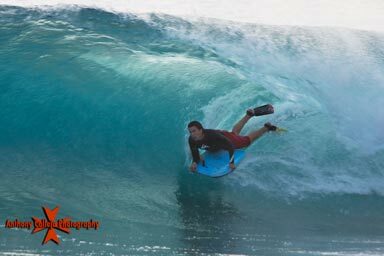 The average bodyboard consists of a short, rectangular piece of hydrodynamic foam, sometimes containing a short graphite rod within the core called a stringer. Bodyboarders typically use swim fins for additional propulsion & control while riding a wave. Surfing is a surface water sport in which the wave rider, referred to as a “surfer,” rides on the forward face of a wave, which is most often carrying the surfer towards shore. Waves suitable for surfing are found primarily in the ocean but can be found in some lakes, in rivers in the form of a standing wave or tidal bore. Surfing can also be done in manmade sources such as wave pools & boat wakes. The term “surfing” refers to the act of riding a wave & not the form (with or without a board) in which the wave is ridden. For instance, the native peoples of the Pacific surfed waves on Alaia, paipo, & other such crafts on their belly, knees, & feet. Not to mention, Bodysurfing, the act of surfing a wave without a board, is considered by some to be the purest form of surfing. That much said, the more modern-day definition of surfing tends to refer to when a surfer rides a wave standing up on a surfboard, which is referred to as stand-up surfing or paddleboarding. Although, another prominent form of surfing in the ocean today includes bodyboarding, which refers to when a surfer rides a wave either on the belly, drop-knee, or stand-up on a bodyboard. Not to mention, knee boarding, surf matting (riding inflatable mats), foils, bodysurfing, & so forth. Three major subdivisions within sitting -up surfing are longboarding, short boarding, & stand up paddle surfing (SUP), reflecting differences in board design, including surfboard length, riding style, & the kind of wave that is ridden. In tow-in surfing (most often, but not exclusively, associated with big wave surfing), a motorized water vehicle, such as a personal watercraft, tows the surfer into the wave front, helping the surfer match a large wave’s higher speed, which is generally a higher speed than a self-propelled surfer can obtain. Surfing-related sports such as paddleboarding & sea kayaking do not require waves, & other derivative sports such as kitesurfing & windsurfing rely primarily on wind for power, yet all of these platforms may also be used to ride waves.